I lost my daughter Pamela on March 27th 2010 to a heroin. Pamela's struggle began when she was a senior in high school. 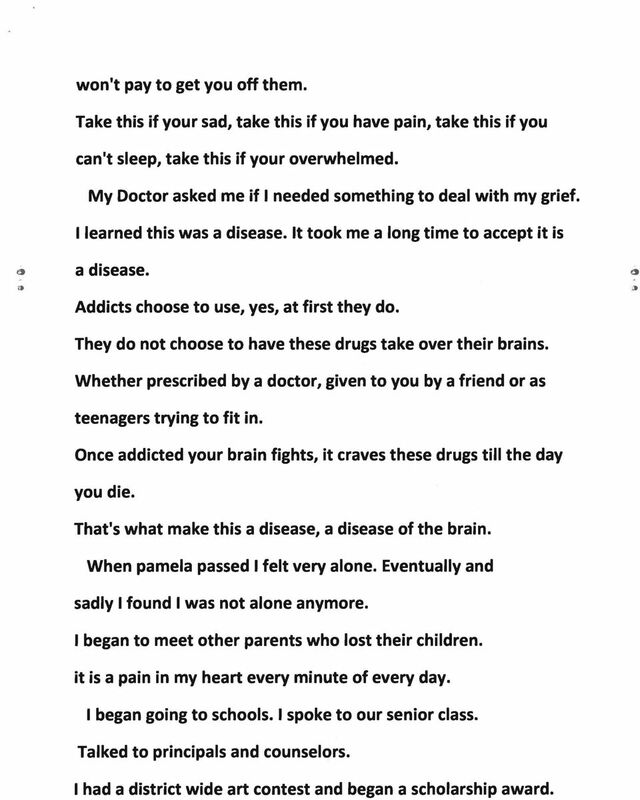 Download "I lost my daughter Pamela on March 27th 2010 to a heroin. 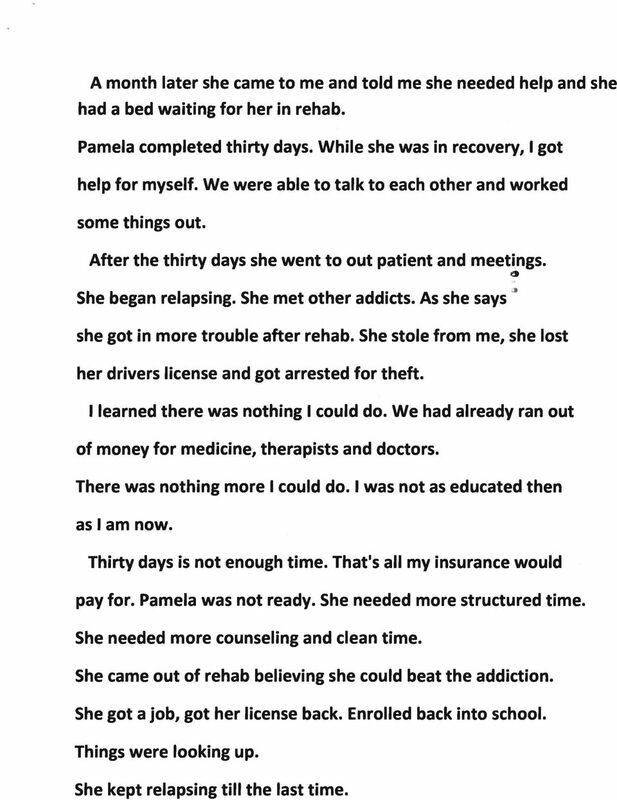 Pamela's struggle began when she was a senior in high school." 1 Tricia Stouch I lost my daughter Pamela on March 27th 2010 to a heroin overdose. She was nineteen years old. Pamela's struggle began when she was a senior in high school. Pamela left me a journal on her journey of being an addict. She writes about first being curious about ~ugs and their effects. Then she shares how she felt her long time friends no longer wanted her around. She did not feel she could get in with another "click" and began hanging out with the outcasts, as she calls them. These outcasts were using perscription medications. I am a stay at home mom. I was Pamela's softball coach and was at all school functions. I knew her friends and their parents. I taught my kids to work. Pamela began work at the age of fourteen. She bought a car at age sixteen. She paid her insurance, paid for her phone, clothes and entertainment. At the age of eighteen she was managing our local pizza hut restaurant. 2 Pamela was a high school graduate and completed her first year of college. Not what society thinks an addict would be doing. After her high school graduation I knew there was a problem. I figured she was experimenting with marijuana and alcohol. But, she was always at work, was home for curfew and at the " dinner iable when not working. I figured after the summer she would go away to college and get away from these people I did not know. Little did I know that after I dropped her off at college she was detoxing. There were many phone calls from her crying and not feeling well. I figured it was homesickness and she would be alright. After her second semester she called to tell me she had transfered to a school closer to home. After she came home things got much worse. She was not coming home, we were not getting along, she attacked me physically. This was not my daughter. I realized something was very wrong. When I confronted her she attacked me. I did get her into a rehab but she left after two days. 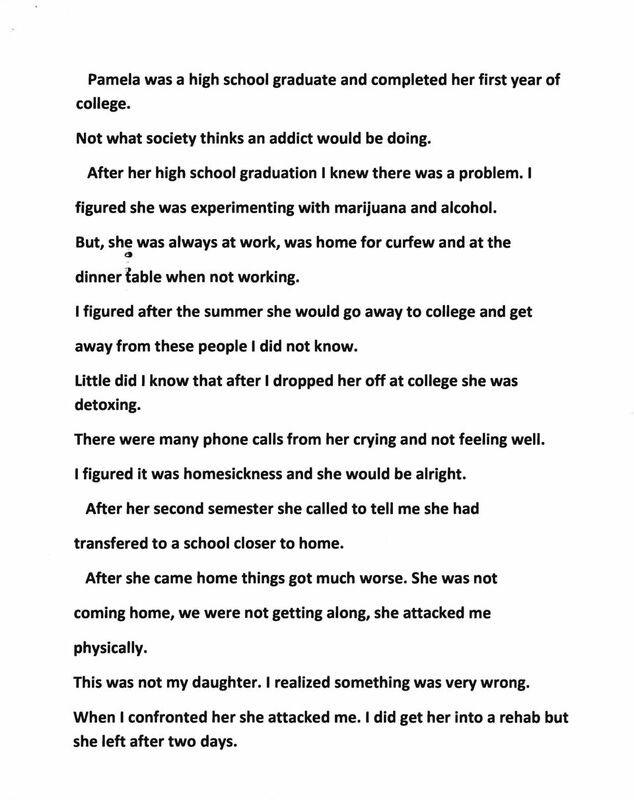 3 A month later she came to me and told me she needed help and she had a bed waiting for her in rehab. Pamela completed thirty days. While she was in recovery, I got help for myself. We were able to talk to each other and worked some things out. After the thirty days she went to out patient and meet~ngs. ~ She began relapsing. She met other addicts. As she says ~ she got in more trouble after rehab. She stole from me, she lost her drivers license and got arrested for theft. I learned there was nothing I could do. We had already ran out of money for medicine, therapists and doctors. There was nothing more I could do. I was not as educated then as I am now. Thirty days is not enough time. That's all my insurance would pay for. Pamela was not ready. She needed more structured time. She needed more counseling and clean time. She came out of rehab believing she could beat the addiction. She got a job, got her license back. Enrolled back into school. Things were looking up. She kept relapsing till the last time. 5 won't pay to get you off them. Take this if your sad, take this if you have pain, take this if you can't sleep, take this if your overwhelmed. My Doctor asked me if I needed something to deal with my grief. I learned this was a disease. It took me a long time to accept it is a disease. Addicts choose to use, yes, at first they do. They do not choose to have these drugs take over their brains. Whether prescribed by a doctor, given to you by a friend or as teenagers trying to fit in. Once addicted your brain fights, it craves these drugs till the day you die. That's what make this a disease, a disease of the brain. When pamela passed I felt very alone. Eventually and sadly I found I was not alone anymore. 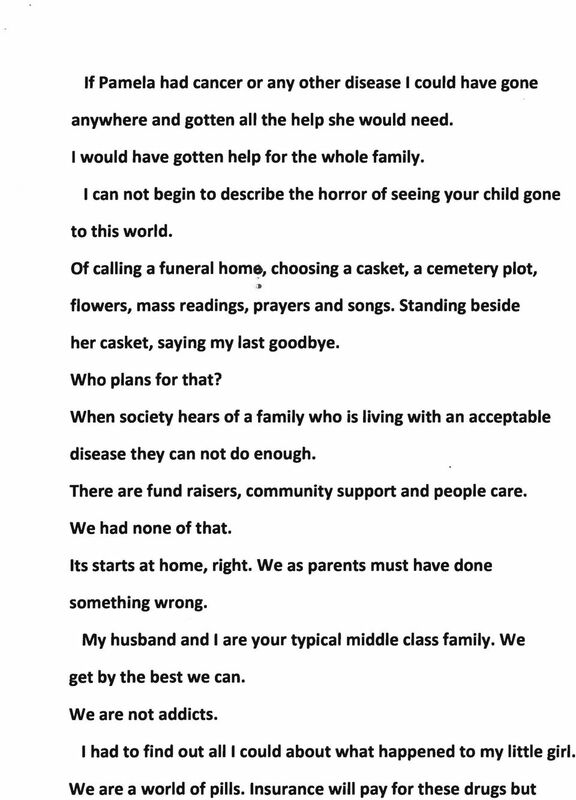 I began to meet other parents who lost their children. it is a pain in my heart every minute of every day. I began going to schools. I spoke to our senior class. Talked to principals and counselors. I had a district wide art contest and began a scholarship award. 6 I was invited to join our heroin task force and have been honored to work with District Attorney Jack Whelan, county council Dave White and Mario Civera, along with the other members. They have been sincere and truly care about what is happening in our schools and communities with this ~pidemic. A few of us are working on becoming a Pennsylvania chapter of N.O.P.E. Narcotic overdose, prevention and education. NOPE has a program for middle school, high school and parent presentations. They are a non profit program out of Florida. My wish is for parents, families and friends to begin talking. Do not say, not my child. To educate our young children on addictions. Fourth, fifth and sixth grade is not too young as this is when they begin using. If you you have a suspicion, do not be embarrassed to ask for help. I knew something was wrong with Pamela, I just did not know how serious it was. We must remove the stigma. 7 We must remove the shame. We must question our doctors. We must lock up our 1nedicines. We must not deny there is a problem. it is an honor to speak for you today and I thank you. And, thank you my Pamela, I love and miss you my beautiful irl. Three-quarters of U.S. adults who have a family member suffering from the disease of drug or alcohol addiction think addiction is a disease. From Behind Bars... to Taking the Bar (Exam) Lynn Burke's Successful journey from Prison to Law School. Riding to Recovery. With her injuries, she was not in good shape, Morford said. Extravagant Generosity John 3:16 Fifth in a Sermon Series based on Robert Schnase's Five Practices of Fruitful Congregations Honk if you love Jesus. The Bible says it, I believe it, and that settles it. I m concerned about someone who has an addiction 1. I m concerned about someone who has an addiction. What can I do? Wilderness Treatment Center 200 Hubbart Dam Rd. Marion, MT 59925 (406) 854-2832 (406) 854-2835 fax www.wildernesstreatmentcenter..
4. (U4C3L2:G1) What are the chances that a first-time user of cocaine will become addicted? Nobody intends to become an addict. Valerie Lemmon Psy.D. in Clinical Psychology, Philadelphia College of Osteopathic Medicine M.S. in Clinical Psychology, Millersville University B.A. Do you or your loved one have a dependency that will require a 12-step traditional rehab?